It’s a short 85 miles from Loreto to Mulegé today. It’s a winding road through the peninsula and back to the Bay of Conception. The road hugs the shore. The beach camps are beautiful: El Requeson, Hotel and Playa Buenaventura, El Coyote, Posada Conception and Playa Santispac, where we stayed on the way down to Cabo. The water is incredibly blue and aquamarine near the shore. It calls to you, for fishing, canoeing or kayaking. 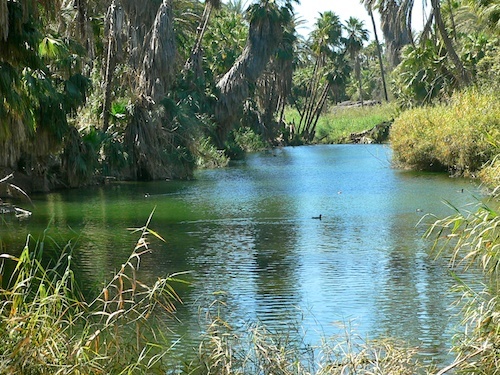 Mulegé is another desert oasis. We all lined up at the Pemex gas station and await Bill’s signal to move in. We go into the camp in groups of three to make it easier to manuever into our spaces. We are in the first group to go in and get settled quickly. We followed the river into town and admired some of the houses and fancy Palapas (outdoor, thatched, open-air rooms) along the way. There are also the ever present, half-built places and some still destroyed from a hurricane the year before. We were told our campground was under three feet of water. The bakery was destroyed and is still not open. 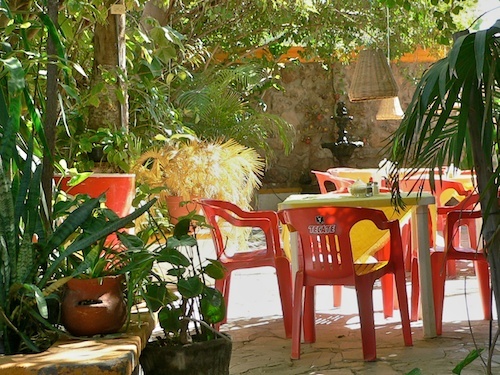 We poked around the shops, had a nice Mexican meal at Hotel Las Casitas, enjoyed some ice cream, picked up some groceries and walked back to camp. After dinner we had some beers with a few fellow travelers and chat with the son of the campground’s owner. Day two is a free day. We had biscuits and gravy with the group for breakfast (fortunately I did not bring a scale with me) then we drove into town and attempted to find the road up the other side of the river that goes to the beach. We drove up and down narrow dirt roads. Some were two way, but so narrow we hoped we wouldn’t run into another car, since there was only room for one. We went in circles and finally gave up, parked and wandered around town some more. We stopped at the “Americano” bar for lunch. 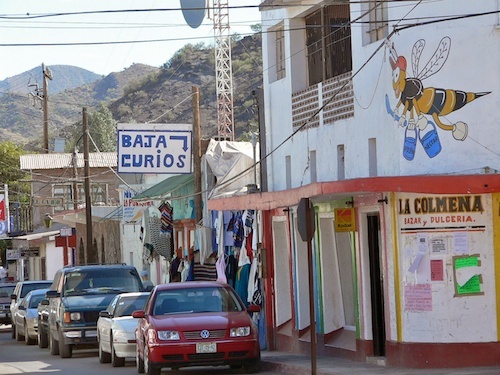 This is the Baja’s fourth largest city and a mecca for many retired American’s looking for a low-cost place to live. While the locale is pretty, and the weather is first rate, basic amenities like electricity and running water are scarce. 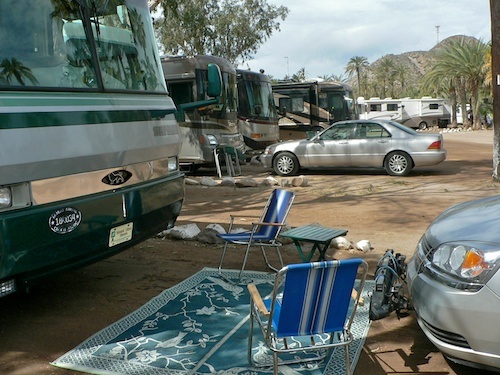 Our RV had better facilities than some of the houses we saw. Until I’m able to live this dream in reality, I’ll live vicariously through your travels. Thanks! 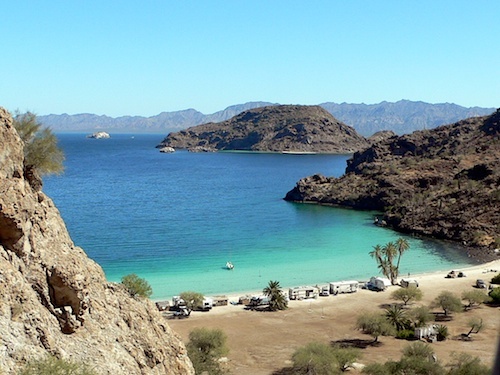 Thanks, Mulege was a favorite, as was the beach at Santispac. Wow it brings memories. 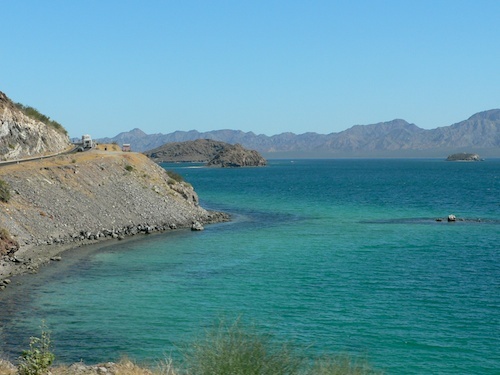 We had been to Mulege before our full timing days. We flew there at Hotel Serenidad where they also had a gravel runaway. The town is cool and we also went to the beautiful beach. I laughed at your comments about travelling in a caravan, I had just been thinking I wouldn’t enjoy that very much. I loved Mexico but haven’t been for a while, I’m going back to PV next week. I am curious about your comment “if things ever get better…”, what did you experience to make you say that? We took that trip several years ago and things seem to have deteriorated in Mexico. Drug cartels, random killings, kidnapping as the new business plan, all seem to be in the headlines these days. It’s not everywhere, many places are still safe, but I don’t think I’d go RVing willy nilly through the back roads these days.